1. It is a quick and easy dispute resolver – simply play the recording to determine exactly what was said. 2. Training staff is so much easier when you have something both management and staff can listen to – and the agent evaluation module will provide key performance indicators. 3. Regulatory and legal compliance – the OAKS product is PCI compliant and conforms to all financial, medical and legal obligations. Screen recording is also available. We will be happy to schedule a live demo for you on any the Call Recording Solutions. On the VoIP Hosted Side, Star2Star offers Call Recording by extension. For a very minimal monthly cost, you can add cradle-to-grave saved call recordings of every call by station. You only pay for the stations you need recorded, which saves money. The ESI IP Server 900 has an optional call recording software add-on that provides full cradle-to-grave recordings on the trunk side. The recordings are accessible from a secure, browser-based link to the server with an authorized login required. Recordings are easily located with multiple search parameters. The ESI trunk-side recording option is a very economically priced option to the premise-based IP Server 900. Toshiba and OAKS International have partnered for a powerful, yet easy to use Call Recording solution for any size organization. The OAKS call record products are scalable and affordable. Trisys is breaking ground with Replay Call Recording! We are also an authorized reseller of Trisys, Inc. 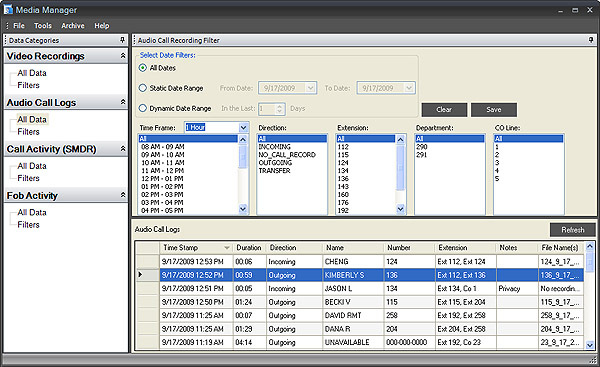 Call Recording and Call Accounting product line. Tightly integrated with Tapit NOVA, our flagship Call Accounting system, Replay Call Recording offers unparalleled ease of use in searching, finding, and managing records at a price affordable to any business. It’s important that you know what’s going on when it comes to employee use of your company’s telephones. We already know this, but do you? It’s the reason that we are the leader in telephone call recording software products. The Replay family of affordable Call Recording solutions by Trisys, is the ultimate cost effective, reliable, easy to configure and maintain call recording product suite for all your voice recording needs. Trisys Call Accounting software works with virtually any telephone system that provides SMDR / CDR information. This product is implemented using industry standard ASP.NET and SQL Server. At Trisys we understand telephone costs represent a significant operating expense for a number of organizations. While our call accounting products don’t actually monitor telephone conversations they are an invaluable component of an effective call monitoring system, vital for businesses of any type. Our Call Accounting cost effective solutions track and automatically reports all incoming and outgoing calls in addition to monitoring internal, transferred and abandoned calls. The ability to account and monitor phone activity helps organizations take control of their business control of telephone costs, identify fraudulent use, provides better management of personnel, increased employee productivity and allocates cost to various cost centers which collectively all contribute to more efficiency and unmasking additional revenue.